I discovered this color in a postcard from a fellow FPNer. 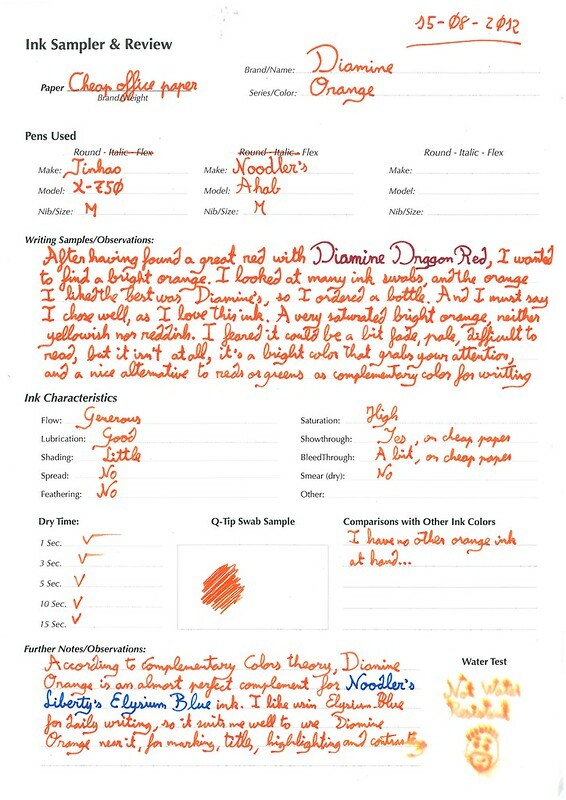 I was looking for a new red, as I was tired of Monaco Red (also from Diamine), and Diamine Dragon Red looked way more vibrant on paper than in online swab pics. I ordered a bottle from Cult Pens (no affiliation, only a happy customer), and when I received the bottle I loaded my spare Lamy Vista with it, and I began to write. I was charmed, it's truly a beautiful color, with generous flow, rather saturated but with some nice shading. A great ink for me! It's a very generous ink, with good flow, but that generates show-through and some feathering and bleed-through on cheap paper. 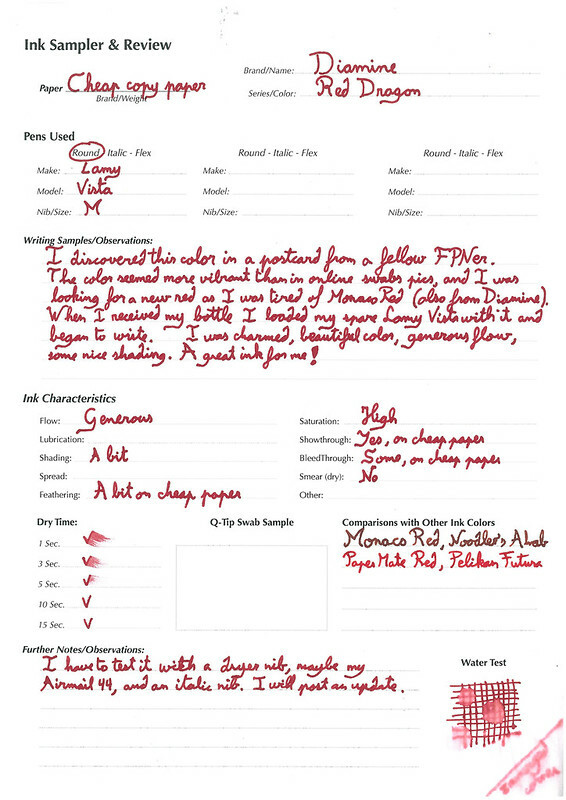 On standard office paper feathering is minimal, as bleed-through, but show-through makes of Diamine Red Dragon a one side only ink on this paper. The ink isn't waterproof at all, as you can see in bottom right corner. The corner itself was submerged in water for 30 seconds, and the grid motif was splashed with water drops. I have to test it with a dryer nib, maybe my Arimail 44, and with an italic or stub nib. I will post an update as I will do it. As usual, I've also posted this review in the Fountain Pen Network. Last week I received a long awaited parcel from cultpens.com. Inside, a green festival : a Lamy Safari Apple Green and a bottle of Diamine Apple Glory. These two are made to be together, a match made in Heaven for anybody who loves bright green colours. The pen is a M nib, and as most Safari, it writes wonderfully. Wet poen, no skipping, always ready to write, it glides on paper without effort, leaving behind a lusty trail of ink. The colour of this 2012 LE is a bright, happy, joyful green, and I really like it a lot, my favorite Safari color. And what about the ink? 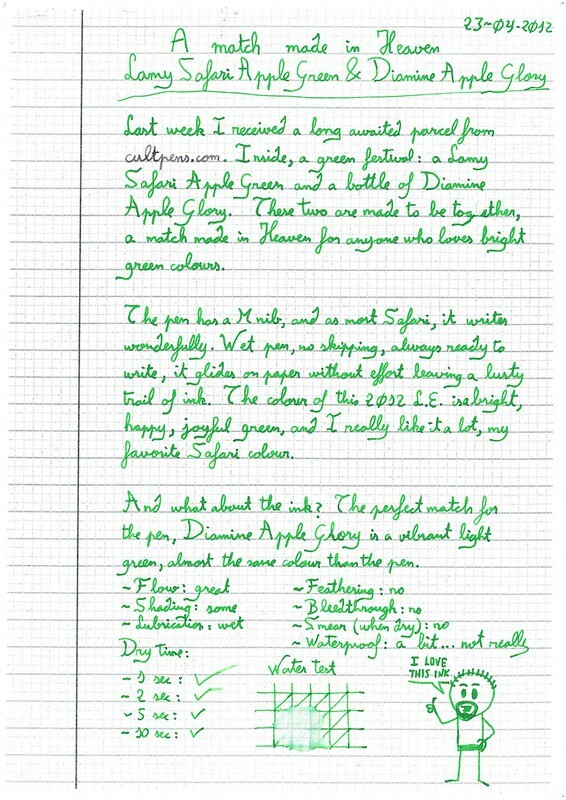 The perfect match for the pen, Diamine Apple Glory is a vibrant light green, almost the same colour than the pen. I really love it!